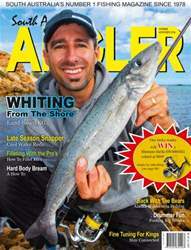 Our October/November issue has something for everyone, whether you're land-based or an offshore fisho. Jamie Crawford's feature on shore-based whiting is a cracker, passing on all you'll need to know about catching KG from the beach or rocks. Lubin Pfeiffer shares his hard-body bream fishing secrets, while both Steve Hunt and Chris Pucknell relive some memorable snapper fishing in local waters. Shane Mensforth tells the tale of his latest adventure – fishing a wild Alaskan River with grizzly bears as company! We test a couple of great new boats, pinch one of Patty Dangerfield's seafood recipes, try out some new tackle and a whole lot more.